"Evocation I: The Arcane Dominion" was released on April 11 via Nuclear Blast Records. It contains 15 folk songs, most of them written in ancient gaulish language. 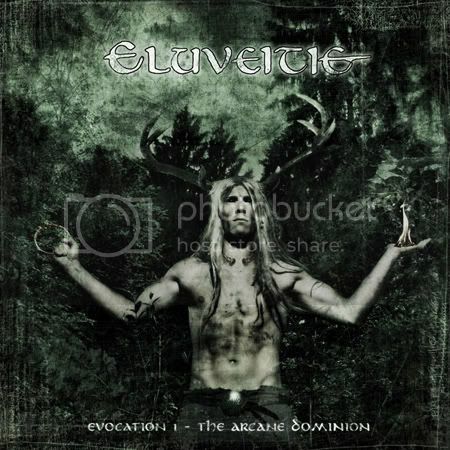 Commented mainman Chrigel Glanzmann: "The tracks on 'Evocation I: The Arcane Dominion' take you on a journey through ancient gaulish mythology, a journey deep into the celtic soul. You'll pass diverse instrumental tracks, setting mythological topics into music, as well as songs, which are exclusively sung in ancient Gaulish language. Most lyrics are 1,600-2,100 years old. We're proud and happy we have some illustrious and excellent guest musicians on this album: Fredy Schnyder from NUCLEUS TORN playing the hammered dulcimer on two tracks, Oli S. Tyr from the German medieval folkers FAUN contributing the magical sounds of the long-necked lute on the title track. Furthermore, Alan Nemtheanga from the Irish pagan metallers PRIMORDIAL presenting his vocal art in two tracks, Mina The Fiddler from the experimental folk band BRANÂ KETERNÂ enchanting two tracks with the sounds of the five-stringed viola and at last Sarah Wauquiez, our former bandmember, playing Zugerörgeli (helvetic accordion) on one track." The "Omnos" video can be viewed below. ELUVEITIE's previous CD, "Slania", was released on February 15, 2008 via Nuclear Blast Records. The follow-up to 2006's "Spirit" is "the perfection of the first album, but still there is enough room to give some new influences a chance," according to a press release.